24 cm ix, 232 p. : ill.
Social exclusion attempts to make sense out of multiple deprivations and inequities experienced by people and areas, and the reinforcing effects of reduced participation, consumption, mobility, access, integration, influence and recognition. This book works from a multidisciplinary approach across health, welfare, and education, linking practice and research in order to improve our understanding of the processes that foster exclusion and how to prevent it. 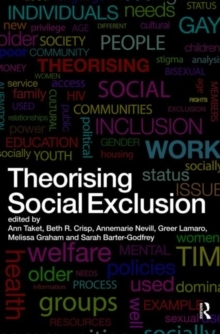 Theorising Social Exclusion first reviews and reflects upon existing thinking, literature and research into social exclusion and social connectedness, outlining an integrated theory of social exclusion across dimensions of social action and along pathways of social processes. A series of commissioned chapters then develop and illustrate the theory by addressing the machinery of social exclusion and connectedness, the pathways towards exclusion and, finally, experiences of exclusion and connection. This innovative book takes a truly multidisciplinary approach and focuses on the often-neglected cultural and social aspects of exclusion. It will be of interest to academics in fields of public health, health promotion, social work, community development, disability studies, occupational therapy, policy, sociology, politics, and environment.